I think most people know of the Maori tradition of facial tattooing or Moko, but I suspect most people see this tradition as being about tattooing (as in using needles to poke a design using ink into the skin). At its roots though it’s more likely an extension of their tradition of wood carving — similar patterns are chiseled into their homes, furniture, and boats. Mokos appear to have began by applying this wood art to the human body, literally chiseling or carving designs into the face, using similar tools for similar results. Some time after this practice began, ink was the added to the scars, making them more visible, and in time the tradition slowly moved away from scarification-based methods to tattooing-based ones. Some early photos show the three dimensional nature of Mokos created using the ink-rubbing scarification technique, although by the time Western anthropologists began documenting the practice it was already falling out of fashion. Anyway, I was reminded of that history when I saw this skin peel done by John Durante (of Seattle-based jewelry company Evolve), which you can see here both fresh and well into healing. I really like the way he has used a sort of “reverse negative space” by cutting out a simple shape, but leaving a circle of skin in the middle untouched. As to why these facial scars inset rather than raising (as most scars do), it’s possible that it’s some evolution that makes facial injuries less likely to disfigure, it could be due to there being less subcutaneous fat, or it could be due to the vascular nature, but I don’t really have a good explanation as to why the majority of facial scars are “innies” rather than “outies”. If there are any medically aware readers that want to save me some googling, I’m like a Ferengi… all ears. You don’t have to move far off the face for the scarred skin to start being more likely to raise than stay inset. Here’s another good example of a scar showing fresh versus healing, a throat piece done by Brendan Russell of Tribal Urge in Newcastle, NSW, Australia. 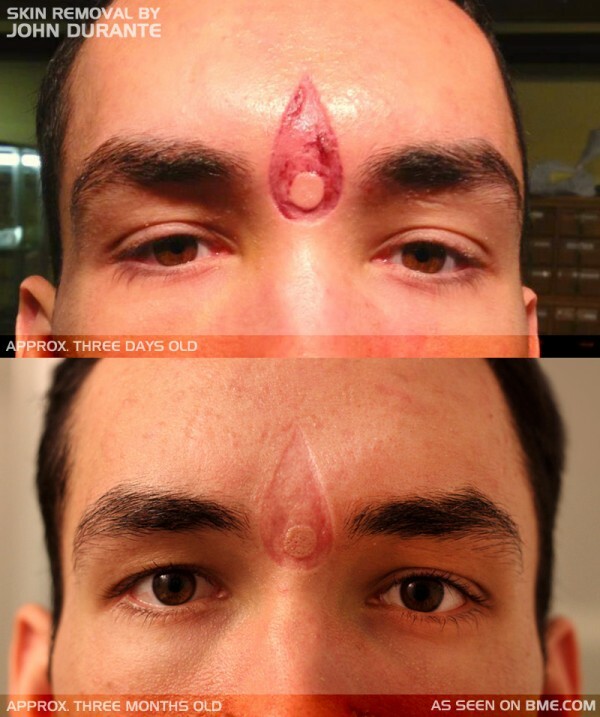 The sharp-eyed will notice that this isn’t just a skin removal scar by the way — it’s also an ink rubbing done with white ink, which has the interesting side-effect of making the age of the scar difficult to eyeball. 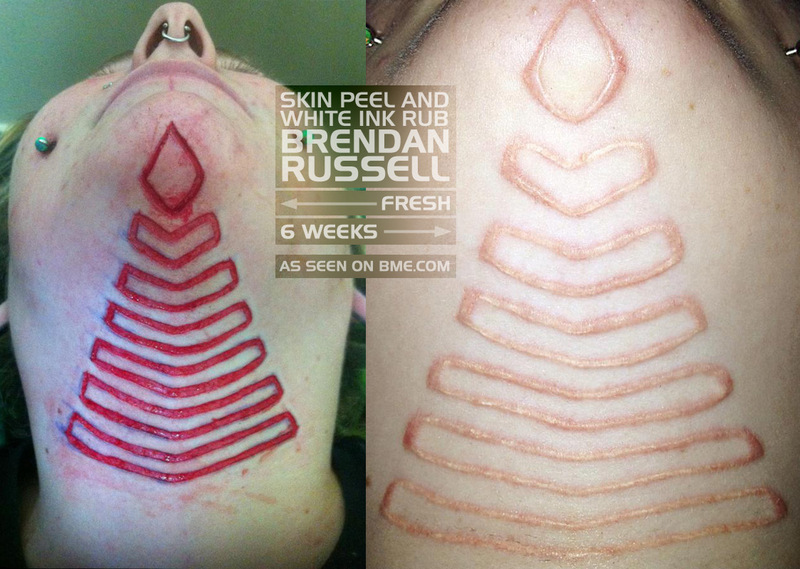 This entry was posted in ModBlog and tagged Facial Scarification, Flesh Removal Scarification, Ink Rubbing, Scarification, Skin Removal, White Ink by Shannon Larratt. Bookmark the permalink. Shannon Larratt is the founder of BME (1994) and its former editor and publisher. After a four year hiatus between 2008 and 2012, Shannon is back adding his commentary to ModBlog. It should be noted that any comments in these entries are the opinion of Shannon Larratt and may or may not be shared by BMEzine.com LLC or the other staff or members of BME. Entry text Copyright © Shannon Larratt. Reproduced under license by BMEzine.com LLC. Pictures may be copyright to their respective owners. You can also find Shannon at Zentastic or on Facebook. IS there any good scars with actual color ink rubbings mixed into them besides white? I have a good size facial scar that I battered and beaten up by separation, scrubbing and salt rubbings, but it healed very well making it a super faint and barely noticeable. Francisco, ink rubbings can be done successfully with any color. I’ve recently posted a UV one for example (and others in the past).